The Acadia Teacher Fellows program is a unique professional development opportunity for educators to gain hands-on experience and develop a personal relationship with Acadia working side by side with park interpreters, researchers, patrol rangers, resource managers, trail crews, and other specialists. What is a Teacher Fellow? The Acadia Teacher Fellows program gives K-12 classroom teachers a chance to spend part of their summer living and working in Acadia National Park. 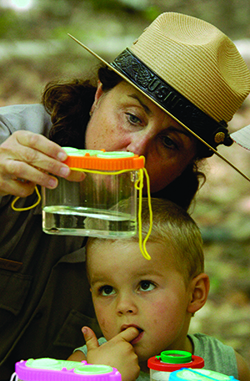 Acadia welcomed its first teacher in 2007, through the nationwide “Teacher-Ranger-Teacher” program. In 2015 the park renamed its program, establishing the Acadia Teacher Fellows. Teachers spend six weeks working in the park. They spend most of their time engaging with park education projects, learning about park resources, and developing lesson plans to use in their classrooms and in the park with students. Their experience will also include exposure to a variety of field work performed in the park (e.g. public interpretive programs, research studies, boat and road patrols, trail construction, community outreach, and volunteer projects). Teacher Fellows develop lesson plans based on their park experience and, when they return to their schools in the fall, share their projects with their students and colleagues. During National Park Week in April, teacher-rangers can wear their Acadia Teacher Fellows uniform to school and engage a wider education audience in presentations that relate to Acadia and the National Park Service. The Acadia Teacher Fellows program is an investment in teacher training and experience, for the benefit of kids, teachers, and Acadia National Park. It offers schoolchildren an invaluable opportunity to connect with their national heritage and gain an understanding of special natural places and the need to protect them. Unfortunately, in this time of tight budgets, similar programs are being reduced or cut in parks around the country. In 2013, a $25,000 grant from a Friends of Acadia donor helped Acadia to expand this program from two to seven teachers, providing each a stipend and housing if needed, and funded field trips during the school year to bring students from the teachers’ home schools to Acadia or other public lands. Since then, Friends of Acadia has continued its support of the program.